Actor and Marine R. Lee Ermey, center, stands with GI Film Festival organizers Laura Law-Millett and Brandon Millett on Saturday, May 23, 2015. US Naval Institute photo. 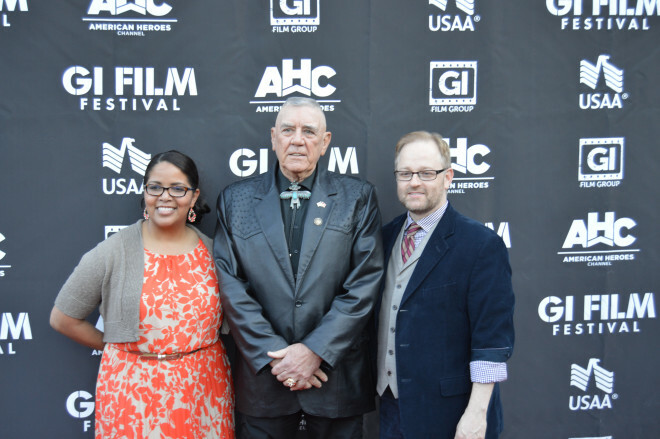 Actor and former Marine drill instructor R. Lee Ermey was honored at the GI Film Festival 2015 with this year’s Memorable Military Movie Character award for his award-winning portrayal of Gunnery Sgt. Hartman in the 1987 movie Full Metal Jacket.